“Tim, can you come over? I can’t unscrew this part! 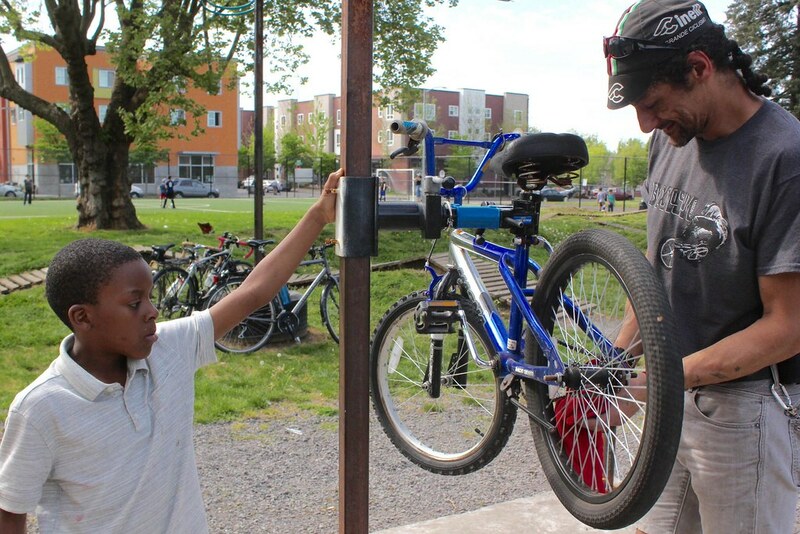 Tim?” Royal, a third-grader, shouted out eagerly to one of our two bike mechanics, Tim and Carl, who run the New Columbia Bike Repair Hub on Wednesday and Saturday afternoons. It was an extra busy Wednesday with limited volunteer support. Tim said he gets anywhere from zero to four volunteers in one shift, and it could get hectic. 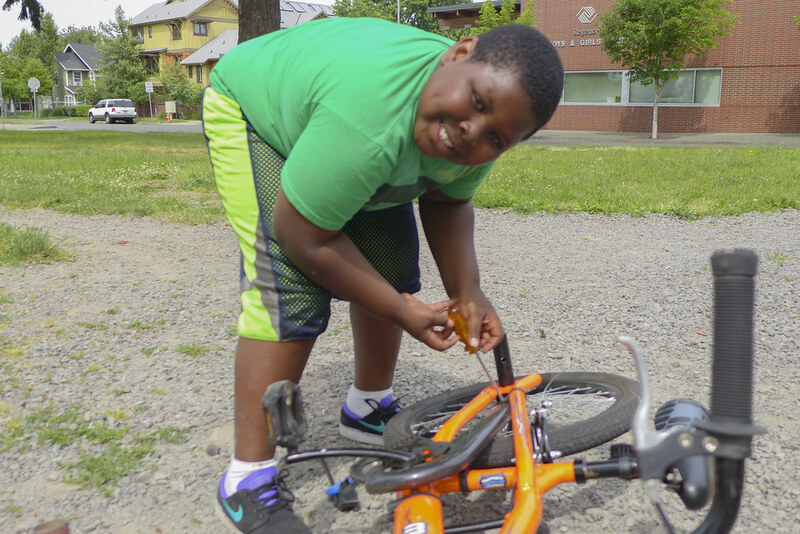 While busy helping another kid adjust the new handle grips on his bike, Tim told the group of three friends he’ll help them in a minute. The three third-graders looked a bit frustrated with the uncooperative bike, but they still kept trying to turn with a big wrench in their hands. They were not the only group trying to solve bike problems on their own. Some kids simply stopped by, looked for the right tools, and started working on their own before receiving help from Tim or Carl. New Columbia in North Portland is a diverse, affordable housing community managed by Home Forward. Children count for over 50% of the population. Before the Community Cycling Center started the Bike Repair Hub, there were no bike repair shops nearby and many broken bikes were lying around the neighborhood. The Hub brings in free bike parts and accessories from the Community Cycling Center bike shop and offers free bike repair service to the community. A couple years ago, the Community Cycling Center built a skills park on the grass next to the Hub for kids to practice riding on ramps and berms. It’s very convenient for kids who can’t wait to test ride their bikes after getting them repaired. 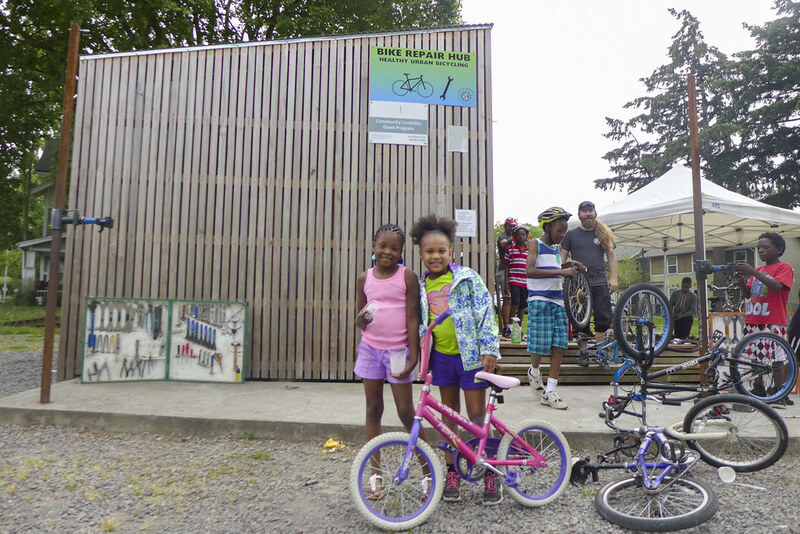 Although the Hub is small, it provides a variety of services that keep bikes safe and running, ranging from fixing a flat tire, giving out free locks and helmets, to building a new bikes from donated second-hand parts. 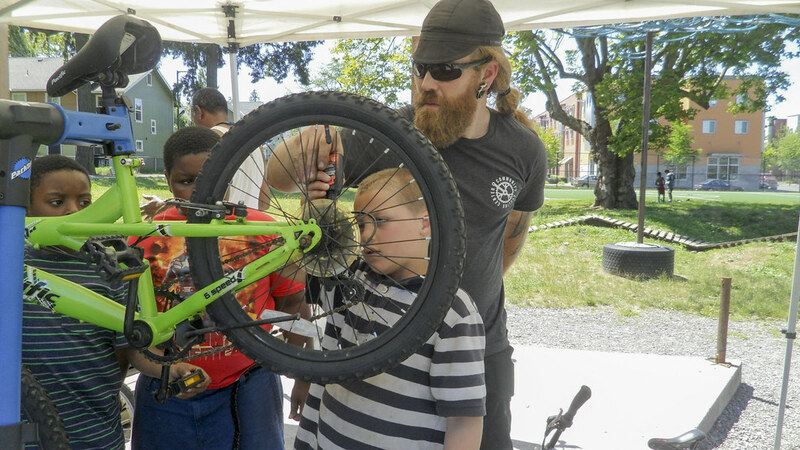 Tim, Carl, and the volunteers also teach basic bike mechanics to kids who are interested. They have recently launched a new program call “Build a Bike” on Saturdays. It gives kids who volunteer at the Hub for twenty hours the chance to build their own bike. Many kids told me that they received their bikes right at the Hub or from the popular Holiday Bike Drive in December. For a lot of families at New Columbia, these are their only options to gain access to bikes. The success of the Bike Repair Hub is largely due to Tim and Carl’s hard work. They make the Hub a very accessible and safe place for everyone. They know the kids by their names and prevent bullying from happening. They explain the mechanics patiently both for kids and adults, while encouraging people to stop by more often. It is their hard work that keeps the Hub running and makes it thrive in the community. We have an Indiegogo campaign for the Hub so that Tim and Carl can double their working hours and serve more community members. Head over to the campaign page and support Tim and Carl in doing more awesome work!